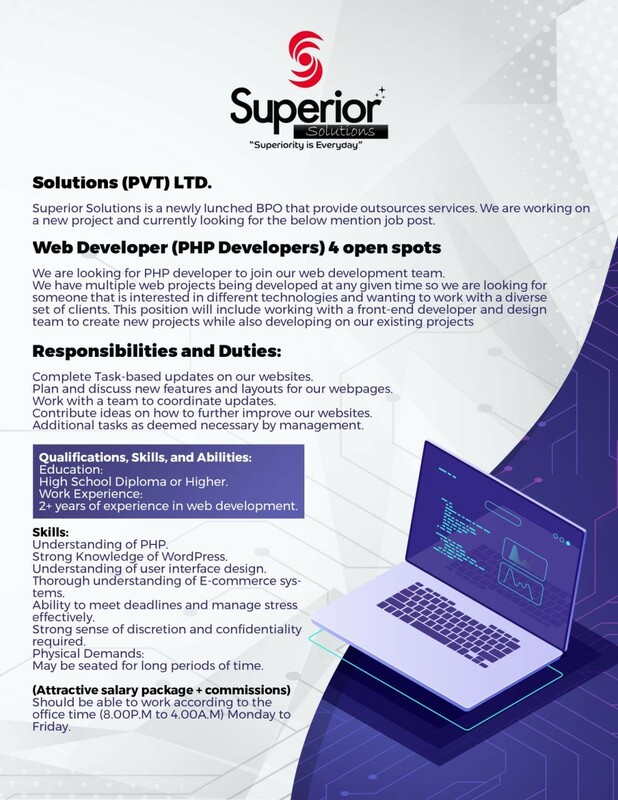 Web Developers We are a newly launched company looking for energetic talented individuals who are capable of building a custom website. The selected candidate needs to attend office 5 days a week. and willing to work from 8.00PM to 4.00AM. Need to have a good understanding about PHP Prefer a candidate close to Kiribathgoda / Kaleniya / Wattala / Paliyagoda and close by area because our office is located in Kaleniya. If you are close to the above mention locations, the company will provide drop transportation. The 1st (2 or 3 months) you will have to work on 8.00PM to 4.00AM and later on, we are considering to shift on to the day time (9.00AM to 5.30PM) If you think your the right person for this JOB please send us your C.V with any web projects that you have done. If your an undergraduate looking for an internship and have good knowledge on PHP, you are encouraged to apply as you will work with international parties and able to gain good understanding and knowledge.